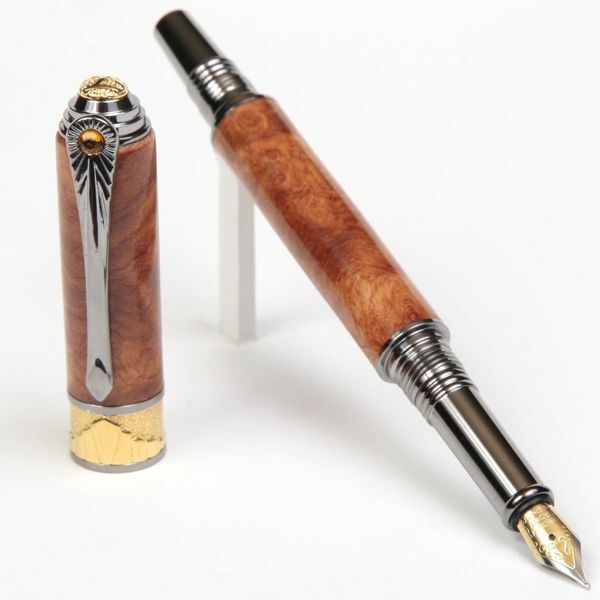 The Lanier Art Deco wood Fountain Pen was created with Art-Deco Motif that spanned the 1920's and 1930's. Designed for discriminating collectors in mind, it is manufactured out of the highest quality Black Titanium and 22kt Gold plated components. The body is handcrafted out of Amboyna Burl and polished to perfection. Every detail of this wood pen is a Work of Art. Made in the USA. Lanier Wood Pens are known for Superior Quality and Artistic Value and make great promotional items. All Lanier Pens are hand tooled and hand crafted one-by-one made from natural exotic woods and may vary slightly from the shown image.